A cryptid of Cornwall, The Owlman. I originally sketched it out as having a fleshy underpinnings that fold out like a snake and flying squirrel, but I also wanted to give it its feathery plume. After visual referencing from the Marquis Graphic novel, I used the feathery plume, but gave it a bit of a tentacle feel and added both modes of its form, one as a mass of tentacled feathers with deep eyes and the top, revealing an unfurled creature excited at the prospect of a kill, with a crown and wings exposed. 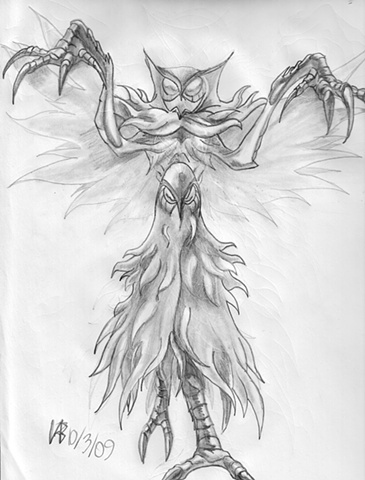 For more info, The Owlman was a series of sightings in the city of Mawman, Cornwall and sometimes compared to the Mothman, here in the United States. Though descriptions are varied, a common theme of it is its glowing red eyes, so any portrayal is open for interpretation. I'm not too proud of it, only because of my thoughts on having a clear vision of my creatures, but I'll leave that to the public to decide.